Metrolinx plans to break ground on a relief valve for the overcrowded Yonge subway line in the next 15 years, the transit agency's CEO Bruce McCuaig told the Toronto Board of Trade in a keynote speech this afternoon. The next phase of a $34-billion provincial project dubbed the "Big Move" will also see the Yonge line extended beyond Finch into Richmond Hill. The elephant in the room, as always, is funding. McCuaig encouraged GTA municipalities and the province to "start the conversation" on ways to pay for the new projects, which also include bus rapid transit lines on Dundas West into Mississauga and Halton, and an LRT on Hurontario-Main from Port Credit to downtown Brampton, but offered no little solid advice on how Metrolinx plans to pay for the work. "There's an expectation there's going to be use of both what are normally considered to be provincial funding tools and municipal funding tools," McCuaig told the media. "What those tools are, the spread between them, and the rates, we'll have to see when we come up with our final advice in June." "It's important to provide more capacity, not just for the downtown area but more broadly in the region so we can support other projects. It's as important to bring suburban people ... as it is to move people within downtown Toronto." When the TTC release its own plan for the relief line, city manager Joe Pennachetti proffered several fees, taxes, and tolls as a way of bridging the gaping funding gap. The items that promised to generate the most cash were a 1 cent a kilometre highway toll ( $1.5 billion), a 1 per cent personal income tax ($1.4 billion), or a 1 per cent sales tax ($1.3 billion). Including the broader GTA in these fees would be a good way to kick-start the fund raising. Specifics on the line could still be some way off. Brad Ross at the TTC confirmed moving the project forward ties in with the Commission's own idea for the connector line most recently discussed in October. "We will work closely with Metrolinx," he said. "There is a financing strategy that Metrolinx is undertaking, the City of Toronto is doing public consultations on funding mechanisms for public transit ... obviously a DRL would require several billion dollars so the funding needs to be in place." "The first thing we need to do is step back from the lines on a map that we're sometimes so quick on drawing and just think about what's the best project," McCuaig continued, mentioning that a Queen/King to Pape route or an alignment that uses existing rail corridors is on the table. 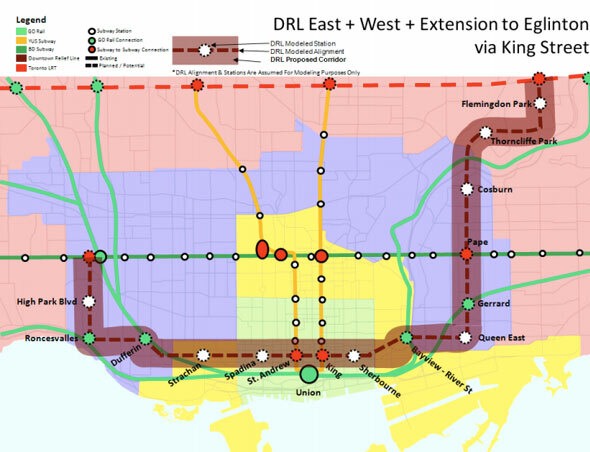 The whopping $34 billion funding target for the DRL and all of Metrolinx's other transit projects is positively eye-watering, but it's certainly achievable. A report on just how they plan to get that money is due on June 1st 2013 and a firm decision will (ideally) be made soon after. They'll need to hurry up if they're to keep to the 15 year time frame. Does this announcement make you anymore hopeful for the DRL? Is this a sign Metrolinx, the TTC, Toronto, and the province are getting serious about finding funding? Sound off.